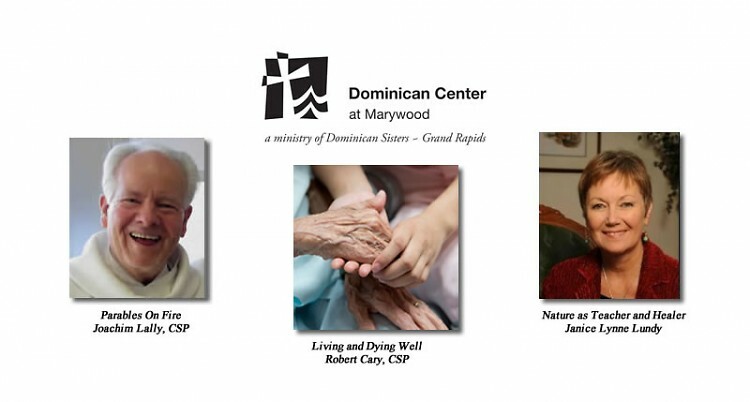 There is a wide range of evening programs being offered in early July at Dominican Center - something for everyone. Day/Date/Time: Tuesday, July 8; 7:00-9:00 p.m.
Day/Date/Time: Tuesday, July 15 086-060-B: 7:00-9:00 p.m.
Do you have thoughts and questions about human life, medicine, and advance planning as we face illness and death? This will be a soul-searching preparation for the conversation we must have with ourselves and loved ones about how we want to die. How do faith, medical realities, and church teaching interact? You will deeply appreciate learning the rich tradition of the Church on these vital issues; and you will feel ready to faithfully make some tough decisions. Day/Date/Time:Thursday, July 17: 6:30-9:00 p.m. The natural world is more than just a pretty place to drop into now and then. Nature's presence invites us into dialogue about how we relate to it (a part of or apart from), as well as the role it can play in creating greater contentment in our lives. Nature can serve as a gifted teacher and healer--a deliverer from the pace and stressors of everyday life. If you are a mystic sort, Nature may even serve as your God connection, taking you deeper into spiritual understanding. Join us as we explore all these roles by spending a beauty-filled evening in nature on the Marywood campus. You will learn a deeper kind of sacred listening, how to amplify your senses, and how to attune yourself to Nature's healing presence. Reflection, journaling, prayer, meditation and group discussion in the great outdoors! Bring a blanket to sit on, journal to write in, and insect repellant if needed. Wear walking shoes and outdoor appropriate clothing.